Lithium technology was first identified in the 1970s, but since Sony and Asahi Kasei designed the first commercial lithium-ion batteries in 1991, their widespread use has become 66% of all portable batteries in the 2011 Japan. It must be known that a lithium battery is different than a lithium-ion battery. The lithium battery is a disposable (one time use) battery designed with a lithium metal or compound as the anode. This cell can produce between 1.5V to about 3.7V. Typically, because the lithium has superior charge density – it can last a very long time in low current applications – it is installed in applications or products that will be seldom serviced but still provide a critical function. Such things can be remote sensors or beacons. Further, these batteries typically aren’t sold in your local drugstore. The lithium battery is the mother label of a whole array of lithium cell chemistries, but the main factor to identify that it’s a lithium cell is that they do not recharge, thus making them a one time use product. You will notice that the electrons only move from anode to cathode, as shown in the diagram below. Schematic diagram of a conventional lithium-air (oxygen) battery. | Source: AIST. 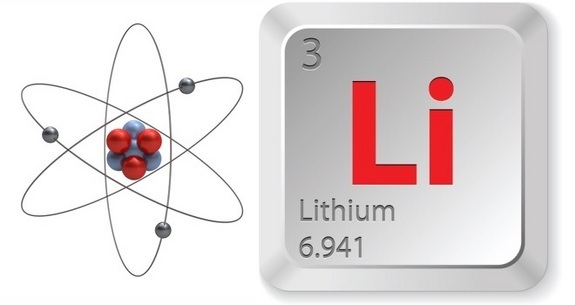 In contrast to the lithium battery, the lithium-ion (also known as Li-ion or LIB) battery is a rechargeable cell, which means that the lithium ions move from anode to cathode when being used in a circuit, and then from cathode to anode when recharging again. 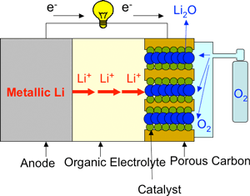 As you can see, the lithium-ion cell has a layer of electrolyte (intercalated) made of a lithium compound. In contrast, the lithium cell has a metallic anode. So, this means that the rechargeable lithium-ion anode can both give away electrons, and accept electrons. This is identified in the diagram above. Lithium-ion cells are similar to lithium cells in that they are both very high-energy density with very little loss of charge when stored. High-energy density means that the cells have a larger tank of fuel, which means they can last much longer for the same amount of size (if we compare to a typical NiMH). Because the regular lithium battery doesn’t have much consumer applications (and because it’s a disposable item) I want to focus on just the lithium-ion battery, and it’s benefits. Comparing the lithium-ion battery to a NiMH and lead-acid battery, we can see a few things. The specific energy of the cell per kg of material is far greater than the other two alternatives. Energy density is far superior to lead-acid batteries, and overlaps a little bit with the NiMH battery cell on the lower end of the lithium-ion technology, and the high end of the NiMH cell technology. Higher charge/discharge efficiency, the less charge is loss to external factors like heating. It must be noted that these numbers vary so much because of the plethora of cell technology, as well as temperatures of operations. An interesting caveat of the lithium-ion battery is that they have no memory. Memory is what you’re fighting with when you’re required to completely discharge the battery cell before recharging it again. So this means that charging it whenever there is available power is an OK thing to do (end years of confusion here). In fact, it’s necessary to do. If the lithium-ion battery pack is completely discharged… it’s ruined. Engineering Note: Proper and safe application of the cell ensures complete discharge never happens. The device will be put into zero-power mode to avoid this. This requires an on-board battery monitor. I wouldn’t be surprised if this is necessary for devices using lithium-ion technology to qualify for CSA Standards. With all good, comes some bad. The lithium-ion battery typically degrades as soon as the battery is built, as soon as the lithium is encased in the battery pack. This degradation is increased with heat. Because of the sensitivity of the lithium-ion discharge (it cannot be completely discharged), an on-board battery monitor is necessary to monitor the status of the battery and automatically safely operate it. This extra and required circuitry adds costs and infrastructure. Further, there is a small chance ( two or three in a million | 0.0002% to 0.0003% ) that the cell will burst into flames. The referenced images would be useful to include in a scientific paper regarding research on lithium ion batteries. How might we get permission to do that? Dear Mark, Please refer to the article referenced as source for the image (source) . On this blog, the image is Figure 1. This article is excerpted from David L. Anderson’s white paper, “An evaluation of current and future costs for lithium-ion batteries for use in electrified vehicle powertrains.”Anderson holds a master of environmental management degree from Duke University. He can be reached at 4332 36th St. S, Arlington VA 22206, david@thatcarblog.com. Pingback: spotlight: carbon nanotubes | everything fullerene.